February 17, 2016 – Women represent only 13 percent of the engineering workforce in the United States. With that imbalance in mind, Raytheon has teamed up with Boys & Girls Clubs of America to introduce more girls to the field of engineering and the career options it offers. 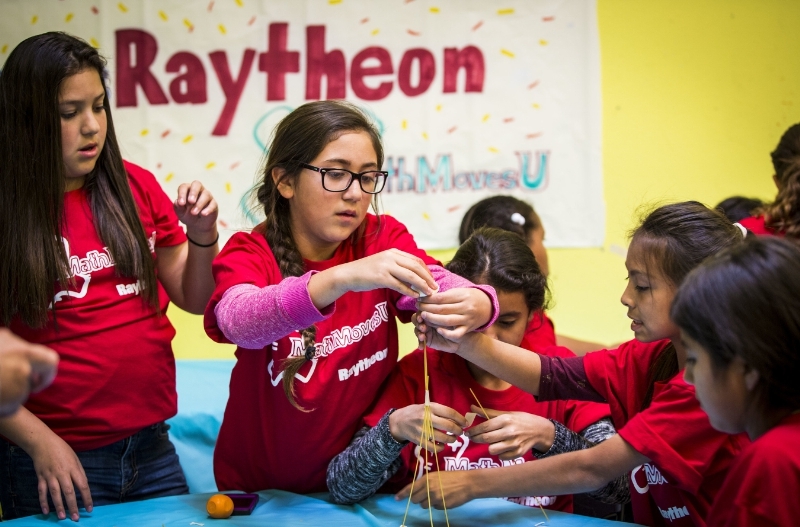 During Engineers Week, February 21-27, Raytheon, a sponsor of DiscoverE ‘Girl Day,’ will host events for hundreds of girls at Boys & Girls Clubs in Alabama, California, Colorado, Florida, Indiana, Maryland, Massachusetts, New Mexico, Rhode Island, Texas and Virginia. Engineers will visit the clubs and lead hands-on learning activities that demonstrate engineering concepts, such as building basic electrical circuits and designing the strongest skyscrapers. Girl Day is just one way Raytheon hopes to inspire the next generation of innovators. Through its flagship program MathMovesU, the company has invested more than $125 million in science, technology, engineering and math initiatives. Most recently, the company pledged $10 million in new, multi-year partnerships with Boys & Girls Clubs of America and Student Veterans of America to help military families succeed through education. Funds support the development of ‘Centers of Innovation’ at Boys & Girls Clubs and affiliated youth centers in military communities, as well as expanding access to Student Veterans of America’s programs and support.